Ronald Agostinelli II from West Roxbury attended Boston Collegiate Charter School. He was a member of the National Honor Society, World Language Honor Society and the Suffolk County DA Youth Council. He was the recipient of the US History Award and the BCCS Citizen Award. He will be attending Suffolk University and majoring in Journalism. Dylan Chalmers is from Roslindale. He attended Catholic Memorial High School. He has volunteered with the Parkway YMCA, the VFW to help set up and run events, CM Students Against Destructive Decisions, peer ministry at St. Theresa Church, and Ethos food delivery to the elderly. He will be attending Florida Institute of Technology studying aeronautics. Christine Conley is from West Roxbury and attended Newton Country Day School where she was active on the soccer, ice hockey, and softball teams, along with yearbook staff and the mock trial team. She worked at the YMCA as a summer camp counselor and as a referee for Parkway soccer. She will be attending Boston College studying marketing/communications. Brian Dubois is from Roslindale and attended Boston Latin School. He was an officer of the Ultimate Frisbee Club, Improv Comedy Troupe and actor & set designer in the Theatre Club all at BLS. He has gone through the scouting program where he attained the rank of Eagle Scout and is an adult leader in the program. He has been a camp counselor at Hale Reservation and the YMCA Bear camps. He is a member of the National Honor Society where he received yearly honors sophomore, junior and senior years. He will be attending the University of Rhode Island studying in the engineering honors program. Want to have some fun and help raise some money? Join the Parkway Rotary club of West Roxbury/Roslindale for Trivia Night on April 28th at J.J. Brannelly's, located at 4432 Washington Street in Roslindale. Registration for the event runs from 6-6:45pm with trivia kicking off at 7pm. The cost is $60 per team with a maximum of 6 members per team. Proceeds go to help the Parkway Rotary Club of West Roxbury/Roslindale. First and second place prices will be awarded. Come out for a great cause to raise some money for the local neighborhood. Plenty of FREE PARKING and CASH BAR! Pre-register today by going to the Calendar tab above and click on Trivia Event. Parkway Rotary members Dominic Rebelo and Uchenna Onyeachom once again plunged into the frigid waters of the Atlantic Ocean in an effort to eradicate Polio. Last year, they were able to raise over $120,000. The event took place at Long Beach in Gloucester and was a huge success. 2015 was a significant milestone in making polio history. There were no new cases of the wild poliovirus in Nigeria. That means we're down to two endemic countries: Afghanistan and Pakistan. If Nigeria can go two more years without a new case, we will have a polio free Africa! All efforts by our partners in this fight are surging forward to eliminate polio everywhere in the year ahead, but its’s not about just delivering the vaccine to the children. The logistical and political challenges are many and costly. Rotary and the World Health Organization, as well as funding from the Bill and Melinda Gates Foundation and other funding partners, are pushing hard to achieve this goal. It will require a huge effort and much more funding to beat out the last cases and to make sure that polio doesn't re-occur in those countries that have been, and will be, certified polio free. If this happens, the globe could be polio free by 2018. 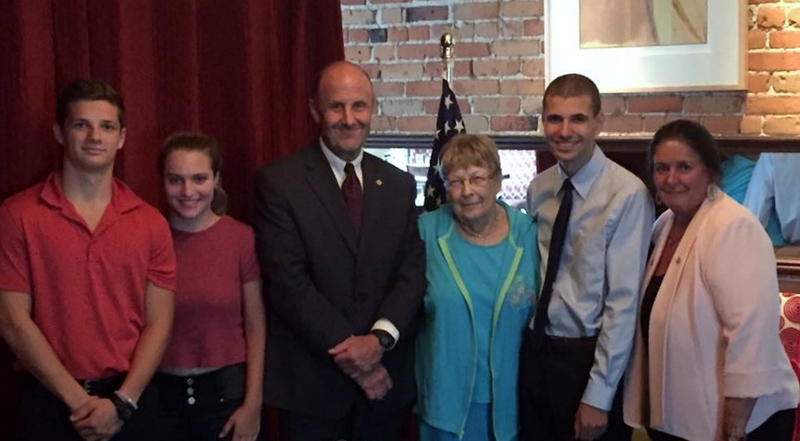 The Parkway Rotary Club of West Roxbury/Roslindale recently awarded $2,000 in scholarships to local HIgh School graduates. The following awards were made: Caitlin D'Amato, who graduated from Boston Latin Academy and will be attending St. Anslem College, Denis O'Connor, who graduated from Boston Latin School and will be attending Suffolk University, Kennedy Barnwell, who graduated from Boston Latin School and will be attending the UMASS Amherst School of Business, and Gabriela Minos, who graduated from Fontbonne Academy and will be attending Fairfield University. Each received the Louis Kfoury, Jr. and Daniel Van Ee Memorial Scholarship. The scholarships were awarded based on a combination of academic accomplishments as well as on community service, as Rotary's motto is Service Above Self. Proceeds from the Rotary's Paul Harris Excellence in Community Service Recognition Dinner and other events funded these scholarships, as well as the other giving the Parkway Rotary Club does in the community. From Left to Right: Branch Librarian Becky Manos, Parkway Rotarians Marilyn LaRosa, Dominic Rebelo, Kelly Peters, and Terry Rezendes Curran. To advance reading and strengthen the sense of community, the Rotary Club of West Roxbury and Roslindale is donating $3,000 to the Roslindale Branch Library to launch a new reading program called Roslindale Reads. The money was raised through private and public funding efforts of the Club, and a matching District Managed Grant from Rotary District 7930. In its first year, Roslindale Reads plans to read Harper Lee's classic To Kill a Mockingbird. Followed then by Harper Lee's soon to be released Go Set a Watchman. This will come out in June. Other books to be read include The Boston Girl by Anita Diamant and All the Light We Cannot See by Anthony Doerr. The Roslindale Branch Library is located in Roslindale Square on Washington Street. All members of the community are invited to join the book discussion group. To learn more about all the books to be read and the schedule, contact the Roslindale Branch Library at 617-323-2343 or email manos@bpl.org. Please join the Rotary Club of West Roxbury / Roslindale as we honor this year's Paul Harris Award recipients. The dinner will be held on Thursday, June, 18th 2015 at 6pm at the West Roxbury Elks lodge. This year we are honoring Martin Bligh of the Corrib Pub and Rich Gormley of William J. Gormley Funeral Service. The 8th annual Rotary vs. Kiwanis softball game and fundraiser was held on Wednesday, May 13th at the Ohrenberger Ball Field, 175 West Boundary Road, West Roxbury. The final score was 39 Rotary - 13 Kiwanis. The series is now tied 4-4. Proceeds benefit the Jason Roberts Challenger League. The most fundamental goal of the Challenger League is to give everyone the chance to play, regardless of limitations. and District Governor Elect David Manzi. his family in West Roxbury. On September 13th, the Rotary Club sponsored a hole at the annual YMCA Golf Tournament. Participating in the round of golf were members Lou Falcone and Stephen Morris. Courtney Leonard is a graduate of Boston Latin Academy, and will be attending Bridgewater State University, with her expected field of study in communications with a concentration in Theatre education. Jillian O'Malley is a graduate of Academy of the Pacific Rim, and will be attending Westfield State University, with expected field of study in movement science. Tenzin Dawa Thargay is a graduate of Roxbury Latin School, and will be attending UMASS Amherst, with an expected field of study in political science and languages. Daniel Wilson is a graduate of Boston Latin School, and will be attending Boston University, with an expected field of study in bio chemistry. Money raised for the project came directly from the Rotary Club of West Roxbury/Roslindale. The Club applied and won a match-ing grant from Rotary International which funds projects that support humanitarian services in the Rotary District of 7930. Casserly House is a center for learning, assistance, and caring. It focuses on multiethnic and underserved people in the community. The Congregation of the Sisters of St. Joseph is the primary sponsor of Casserly House, which is located on Stellman Road in the Boston neighborhood of Roslindale. The director of Casserly House is Sister Nancy Braceland. Sr. Braceland is also a past recipi-ent of Rotary’s Paul Harris award given for extraordinary service to the community. Casserly House provides ESL classes to adults in the morning and provides neighborhood children a facility to do their homework after school. The project had both a fundraising and service component. The funds raised went to update the computer center, which is an inte-gral part of the programs at Casserly House. Due to the age of the technology, many of the computers were unable to perform basic functions, like run Rosetta Stone software. Members of the Club volunteer time each week to working with the students to use computers and improve their English. Students of the center reflect the diversity found in the city of Boston and come from far and wide, including Cuba, Brazil, Vietnam, and El Salvador. They arrive with varied computer experiences. Some have never used a computer before, some have vast experience, but have issues translating to English, and some come from countries with computers, but no internet and so have no skills in accessing and navigating the web. Since the Rotary became involved, two students of the center have found jobs. One was turned down from a job specifically for not having computer skills. This experience steeled her resolve to get computer training at the Center. She then reapplied at that employer and got the position. To learn more about Casserly House, visit www.casserlyhouse.org.